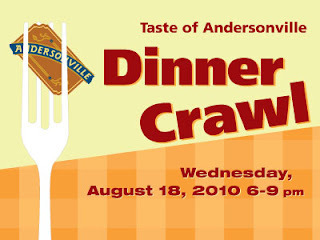 Taste of Andersonville, Wednesday August 18th Reviewed by Edgeville Buzz on August 9, 2010 . Come take a bite out of the neighborhood at the annual Taste of Andersonville Dinner Crawl, on Wednesday, August 18 from 6PM – 9PM. Enjoy your favorites, find new spots to eat, and meet lots of neighbors and friends. Held in conjunction with the Andersonville Farmers Market, this evening is sure to be a foodie’s dream come true.